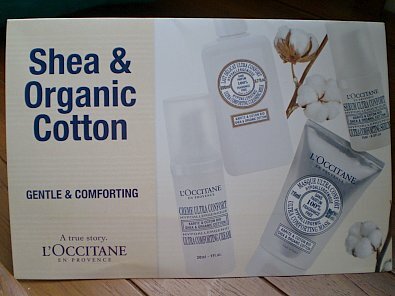 Just days into theÂ new year, L’Occitane has already launched a new skincare range targeting specifically at those with sensitive skin.Â Â The series, Ultra Comforting Shea & Organic Cotton Facial Skincare, isÂ marketed as hypoallergenic and is said to soothe and protect even the most delicate skin as the products have been formulatedÂ without perfumes, colorants, alcohols or preservatives to minimize the risk of allergic reactions that sensitive skins are prone to. And those in Singapore maybe interested to know that from now till Feb 4, a Shea Butter Travel Set consisting of 5 items will be given away with purchase of S$160 inclusive of one Shea Butter product. Tracy: I guess different skin reacts differently. Trigger points for breakout differ for each. I know of pple with sensitive skin who has no problems with L’Occitane but I also know of some who broke out big time with it.